Update – Bodog in the US is now Bovada. Right from the beginning, Bodog founder Calvin Ayre always envisioned a much bigger picture when Bodog first launched as a sports book back in 1994. With the US market clearly in mind from the start, Bodog began to transform into a well respected gambling variety of venues launching a casino and poker network to go along with their sports book. Over the years, Bodog eventually moved into the European and Asian markets, making Bodog one of the biggest online gambling powerhouses in the world! With the likes of poker pro’s David Williams, Bodog Poker is quickly moving up in the ranks as one of the best online poker rooms in the world. 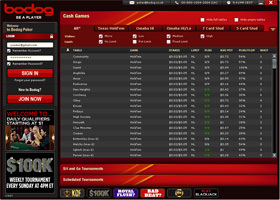 Bodog Poker operates on the Proprietary software platform that is geared towards players that only play a few tables at a time. If you are a 10-15 table playing grinder, then you may or may not appreciate the less multiple table options, but Bodog more than makes up for that in many other areas. Players can expect to be able to play up to 3-4 tables at a time along with “picture in picture” or standard separate window features. Players also have the option to resize the tables as well as change the colors of the felt to their liking. The software runs very fluently as well as quickly to maximize the amount of hands as well as players’ enjoyment. Bodog Poker is one of the best poker rooms for promotions. Bodog Poker starts every player off with a fantastic Welcome Bonus of 110% up to $1100 in bonus cash! If that wasn’t good enough, each month, Bodog allows depositing players that have already claimed the welcome bonus a monthly re-load bonus of 100% up to $500 each and every month! As a new Bodog Poker player, once you’re ready to try out the real money tables, you will get an invitation for 6 exclusive qualifiers for the Sunday $100,000 Guaranteed tournament. Along with all of these great promotions, Bodog Poker runs many weekly and monthly tournament promotions all year long making sure their players are bored while playing in their poker room! Bodog Poker tournaments come in many different varieties from sit n go’s to multi-table tournaments with limit, pot-limit, and no limit tournaments available. Bodog even offers special tournaments for new beginning players that offer low stakes until they are ready to start playing at higher levels. Bodog Poker offers a very unique sit-n-go leader board tournament with the 1st place finisher each getting a chance to play poker pro David Williams heads up in a $1,000 freeroll. What makes this really unique is that it works like a progressive jackpot, so if the poker pro wins, the $1,000 goes into a pot until the next week, until a leader a board player beats the pro! The pot has been seen to grow as high as $16,000 in the past! Along with these special tournaments, Bodog Poker offers many other specialty tournaments such as the $100,000 guaranteed which is played every Sunday. Players also get the chance to win seats into all of the major live events by playing lots of satellites leading up to the main events. Along with all of these great tournaments, Bodog has weekly and even daily tournaments that players can play everyday! Players can expect to find many tournaments to maximize their poker playing excitement and experience! At Bodog Poker, you won’t find huge traffic numbers like some of the other online poker room giants, but a steady flow none the less. Players can expect to find good traffic numbers around 3,000-5,000 ring game players with 5,000 being around peak times and around 6,000 tournament players sometimes peaking around 8,000 players. The majority of Bodog Poker’s traffic is found at the micro to medium stake levels that mostly play Texas Hold’em. The competition level is appealing to many sharks as the level of play is not the best in the world. This could be due to all of the sports book and casino players that have decided to give Bodog Poker a try. Good players should be able to clean up nicely at the tables. 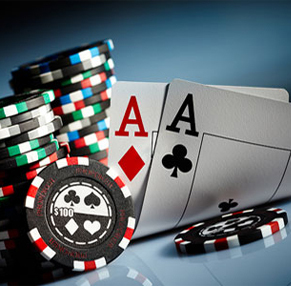 Bodog Poker offers all of the most popular poker games for exciting online poker play. Players will find such games as Texas Hold’em, Omaha, Omaha HI/LO, 7-Card Stud, 7-Card Stud HI/LO, as well as 5-Card Stud. Players will find that all of these games can be played with limit, pot-limit, and no-limit stakes either in ring game or tournament fashion. Bodog Poker offers a good selection of deposit and withdrawal methods for all players globally. Bodog Poker accepts Visa, Mastercard, ATM online, EwalletXpress, Moneybookers, Instadebit, MyCitadel, Citadel, InstaCash, Neteller, Click2Pay, as well as Bank Wire Transfers. Bodog Poker’s deposit and withdrawal selection is smaller then a lot of other poker rooms but players can find an option that fits them none the less. Although Bodog Poker’s online support doesn’t offer live chat, they do still offer 24/7 support 365 days a year via email and telephone. 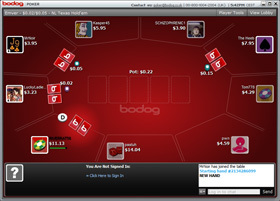 Players can expect very fast responses to emails and for instant answers to questions; players can give Bodog Poker a call for instant support. Bodog Poker takes pride in providing one of the safest and secure online poker sites in the world and would like to ensure every player’s privacy is safe and secure, hiding behind one of the most in depth encryption software technologies in the world. Bodog Poker’s Random Numbers Generator (RNG) is regulated and tested by a third-party company and guarantees a fair and accurate poker game each and every time you play. Bodog Poker definitely ranks among the best online poker rooms in the world!